It might have taken him nine games, but Zach Mettenberger has arrived as a top tier SEC quarterback. He gets it now. He understands how to let that strong arm work for him now. He stood in the pocket last night and took everything that Alabama threw at him. He made clutch throw after clutch throw. He led his Bengal Tigers to a late fourth quarter lead, only to see the game lost in the Tide's successful late game drive. He displayed poise under pressure. He performed better than admirably, he performed like the kid signed out of high school by UGA was supposed to look all along. He played well enough for his team to win. He deserved to be the winning quarterback. However, the efforts of Mettenberger and his team fell just a little short against the number one team in the country. LSU might have lost the game, but they found there quarterback. He was there all along, but now they don't have to worry about him any more. Number '8' was just a little bit late. 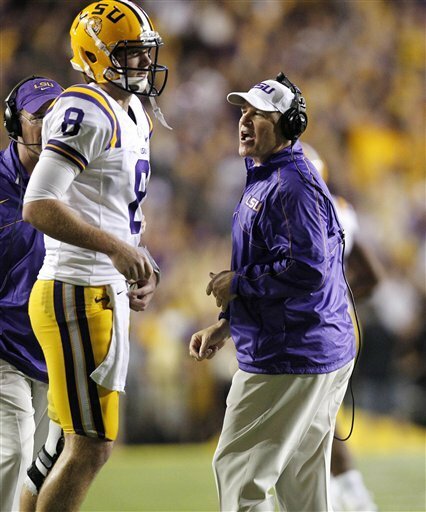 Zach Mettenberger IS the quarterback of Louisiana State University. No doubt about it.